This year, they’ll be away for three weeks. I’m heartbroken and kidsick already. 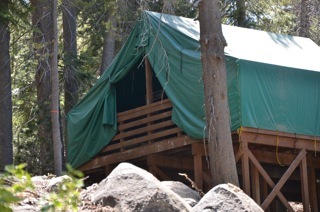 Last week, my kids went off to sleepaway summer camp again in the high Sierras—their third year in a row at Gold Arrow Camp. I will never, not ever, forget the first time I dropped my kids off at camp. The drop-off didn’t go very well. When I was a kid, I begged and begged to go to sleepaway camp with my best friend, Rory. I did extra chores to earn it, and I counted the days until I got there. I don’t remember being homesick, or sad at the drop-off. I remember feeling wild and free. I loved the horses and the outdoors and ceramics. I got postcards from my teachers. It was awesome. My kids had mixed feelings about going to camp that first year: They were excited, but also scared. “Two weeks! ?” my youngest cried when I told her what, to me, was great news: They were going to summer camp! I said this knowing full well that sailing is actually not on my daughters’ bucket list. It’s on mine. The kids spent the last few weeks readying for camp and making serious sister pacts to stick together. My younger daughter, Molly, was particularly concerned about what would happen if her older sister made friends first. Would Fiona and she still pick the same activities? Could Molly join Fiona with her new friends? Pinky-swears of allegiance were traded, plans to sneak into each other’s cabins made. Molly had a plan: Fiona would take care of her. She was nervous, but also excited. That is, until about an hour before we arrived at camp. At which point Fiona became more clammy than cool and collected. She developed vague “not feeling well” symptoms. She was too carsick to eat lunch. When we arrived, she was faintly green. Frankly, I was feeling faint myself. But the thing is, I believe that it is important to challenge kids. To get them truly outside of their comfort zones so that they can grow. Hence two weeks instead of a mini-camp. My desire to challenge my kids was reinforced in an Atlantic article about “Why the obsession with our kids’ happiness may be dooming them to unhappy adulthoods.” The gist of this article is that “kids who always have problems solved for them believe that they don’t know how to solve problems.” And the article is right—they don’t. The article reminded me that happiness—an often fleeting emotion—in and of itself is not the goal. That comfort—my own or my children’s—is not the goal. Instead, all of this is about how to lead a happy life. And while it’s true that a happy life comes from positive emotions (like gratitude and compassion, for example), it also comes from having the tools we need to cope with life’s inevitable difficulties and painful moments. My kids have had their difficulties—my divorce, a move away from a beloved school and neighborhood, a humbling medical situation—and they’ve risen to each challenge, though not without pain. At any rate, by sending my kids to camp, I was sending them the message that I believe that they can manage loneliness, and homesickness, and anxiety. I believed that they could, at the tender ages of 8 and 10, handle these difficult emotions themselves, without me standing over their shoulders telling them to breathe. As awful as it sometimes feels to me, they simply don’t always need me there, telling them what to do and what to think. In sending my kids to camp, I make it abundantly clear what I value: real time spent outdoors, the social skills needed to make new friends, compassion, gratitude (compassion and gratitude are themes at GAC), and most importantly, their own autonomy. I say all this, but of course deep down I wanted it to be easy for them. So when Fiona became so nervous as we dropped her off that she needed to lie down in the infirmary, I also became a nervous wreck. I had become the lingering parent who wouldn’t leave and who was making the whole thing worse for her kid by trying to make it better. But who could fault me for not wanting to leave my kid in the infirmiry?! I justified to myself. In the end, Fiona rallied, but not before she became so nervous she threw up, just minutes after I got on the bus back to the parking lot. She spent her first four hours at camp with the nurse, who french-braided her hair and gave her cold cloths for her forehead until she was feeling better. She looks back on that time and mostly remembers being bored; Tigger needed to be sure she didn’t have a flu or something, and so even once Fiona felt fine, she had to stay in the infirmary for a while. I didn’t know until she got home that Fiona had thrown up (thank goodness I didn’t know that; who knows what I would have done if I knew). Once I got back to my car, two weeks of profound discomfort began for me. I spent those two weeks obsessively checking the camp website for photos and my mailbox for postcards, looking for evidence that my girls were happy. I answered dozens of emails and comments on my blog, defending my decision to send my kids to camp, and to leave Fiona there in the infirmary, terrified. After what seemed like two years, the kids camp home on the GAC bus, wearing t-shirts that said, “Happy Camper.” And, in fact, that is what they were: so, so happy. Two weeks of being unplugged helped them tune into nature in a way they don’t anywhere else. Though both reported missing home, they found comfort in knowing that they could cope with homesickness. They each tried dozens of new activities and sports, took on new challenges, and learned to accept their discomfort as a part of their growth. Still, sending kids to camp is not for wimps. It requires a leap of faith that the difficulty (and, l’ll just say it, that the cost) will be worth it. It requires an ability to manage the emotional discomfort that comes with not-knowing, not-controlling, not-checking—it requires just trusting. But I’m comfortable with that discomfort. I invite you to visit my blog, follow me on Twitter, join me on Facebook or sign up for my Happiness Tips newsletter. I sent my daughter to camp when she was 9. She had begged to go, and they were supposed to ride horses twice a day, which was her favorite activity. She cried the whole time. They only rode horses twice in the week she was there (every time they were supposed to ride, the 'lightning meter' supposedly went off). She wrote me letters every day, which I never received. It was a horrible, traumatic experience and did not, in any way, "ultimately lead to growth and happiness." She's 17 now, and I'm still angry that the camp counselors didn't call me to let me know what was going on. I loved reading your post, I was a camp counselor for the last 3 summers at a full season summer camp in VT. I shared this article on their Facebook page. And just to let you know, the counselors feel nervous too. Will the kids like us? Will they enjoy our activities? Being from England, I didn't have any sort of camp experience as a kid, but the last 3 summers have been the best of my life. Camp can be a wonderful experience for everyone involved as long as we all remember why we are there and the same goes for the parents. :) Thank you for sharing. What your children were forced to go through sounds HIDEOUS! Did they even WANT to go do camp? Or was it for you? The divorce, the move and the "health situation" weren't enough "challenge" for your kids? Too much, most people would say. To turn one's back on a SICK, scared child, because one cares more what a CAMP COUNSELOR was saying to you than your child's well being? It's shameful. I am thankful every day that I respect my children, respect their choices and refuse to PUSH them into things, simply because I may have enjoyed those things when I was young. I also respect my children enough to know that when they say they don't want to do something recreational, their desire is ENOUGH to not force them to do it, especially if it's something as inconsequential to their lives as "sleep away camp." I'm not raising carbon copies of myself. Growing up is ENOUGH of a challenge without one's mother disrespecting one's desires and leaving one sick and alone in a strange place. Our youngest daughter was offered camp this year. She expressed a desire NOT to go. So, she isn't going. THAT is being respectful of one's children's choices. Forcing her would have been not only disrespectful of our youngest child, but could have ripped an unrepairable tear in the fabric of our attachment and our relationship. And in the long run a few weeks at camp couldn't have been all "that good" for her in the first place, if she didn't want to be there. Resentment would have been a predictable outcome. Breakdown of trust could have been an other. This post gave me a stomach ache. It also made me angry. I'm glad, so glad I respect my children enough to allow them to choose their OWN activities. In years to come my children will not be expressing their resentment at my abandonment or pushing them away "for their own good." They know I LISTEN when they speak and RESPECT what they need and want. I'm not a perfect parent, but at least I respect my children's wishes of what they do with their own free time. FORCING disengagement from a parent, especially children who may have already been damaged by a divorce and the appearance of abandonment of ONE parent (if not both) previously, further disengagement (however seemingly transient by an adult) is an unwise choice I think most seasoned parents can appreciate easily. Sadly, these children most likely WILL remember this event. Most likely not fondly, even if they play it up that way to make YOU happy. My children were not forced. They LOVED their experience, and have been back 3 years in a row. Nor did I leave them with a stranger -- we are good friends with the camp director, a mother of five. I was confident that they were in great hands, and they were very excited about the experience. Clearly this post struck a nerve with you, though. I read the post and I see "nervous" "scared" "clammy" "vomited" "My bucket list, not theirs." Do you blame me? It didn't sound to me like they wanted to go. It sounded like YOU wanted them to go. "They wanted to go." It sounds like people I used to work with (for?) in Day Care situations, "Baby LOVES Day Care. He doesn't even look at me when I come to pick him up." Uh-huh. Some parents read their children very poorly. One of two things was going on: 1) You child was so scared/nervous/clammy that she vomited AND should have been taken home. OR, she was sick with something that could have been contagious and/or made her very uncomfortable, miserable and ill and SHOULD have been taken home. You relate it as a funny story. I see no humor in a sick child being abandoned. Yes. You hit a nerve. A sensitive one. I try to parent with as much care, empathy and respect for my children as possible. I RESPECT my children and their needs, and their health AND the health of the children around them. Sick children should be home in bed and with their parent. Not alone, and/or with their parent's "good friend" and miles from home. It wasn't fair to your child and it may have not been fair to other children at the camp if she had been contagious. Even if she wasn't contagious, she was sick and should have been able to count on her MOTHER to comfort her. Not mom's "good friend." On the occasion that my kids get (or used to get) sick at school, I'm there to pick them up, usually within minutes of being called. Work or not, plans or not, busy or not. My children were NEVER "someone else's problem." That is the problem. Children should be able to trust and be comforted by their parents. Especially when sick, but even when not. Not forced into novel situations that are on their mother's "bucket list" (seriously?) or on mom's list of her own favorite childhood activities. You chose to put a story that many parents would be appalled by on a public forum. Did you think everyone who read it would think how wonderful it was that you left scared, nervous, clammy, sick children away from you for two weeks, because the experience was on YOUR "bucket list?" Yeah. You hit a nerve. People making parenting decisions without empathy bugs me. Blogging about such parenting as if it were funny or helpful hits my nerves even harder. I still don't know "why" you sent your kids to camp, although it's the title of the post. The visual and visceral image of your daughter sweating, vomiting, shaking and feeling sick, scared and alone blots out virtually everything else your article had to say. I'm not one to post negative comments online but your self-righteous comments on this post and judgmental attitude to this lady who you do not know provoked a response from me. The way you refer to the "camp counselor" says it all for me. As a 27 year old former camp counselor with a deep passion for working with children, I can tell you that we want the best for children too. We're not all out of high school and just wanting a summer job. I started working at camp at 24 years old and do not appreciate your patronising nature. OF COURSE some children are nervous when they come to camp, are you trying to say you have never been nervous about trying something new? Every child reacts to nerves differently. It doesn't mean they did not want to go. And the camp counselors love the kids. We are the big sister or brother some of them never had and 99% of kids at my camp return year after year and have the self proclaimed "best summers of their lives." Beautiful and meaningful experiences are found everywhere not just at home with mommy. For you to suggest that this parent is anything other than loving and supportive of her children is ridiculous. I honestly don't care how old you are or how many children you have. That is irrelevant to me because I judge people based on their kindness and compassion for others. Hurl some abuse at me if you like, I can take it. That is all, be well. to "hurl abuse" at you or anyone. I have my right to disagree that sending an obviously SICK child to camp and leave her there is a good parenting decision. I stand by my affirmation. It was a poor choice. The counselor SHOULD have let Christina know that child had become sick and the child SHOULD have been taken home. Some kids may enjoy sleep away camp, many do not. Many however, are forced into these camps so their parents can have a quiet summer. I know too many people who have done this. You may well be a very good camp counselor. But, no one is a replacement for a child's mother when that child is sick. You may be the best counselor in the world, but few mothers would think you are a substitute for themselves when their children are ill. MANY children have fun satisfying summers without being sent away. There is more than one way to have a good time, and many children still do better under the supervision of their own parents than under the care of other people for weeks at a time. As I said, my main problem was that the child had become sick and that NO ONE saw fit to bother to tell her mother until her mother was home. I have no idea how far from the camp Christina is, but she should have been told the child was sick so she could make a MOTHERING decision (not a camp counselor decision) on her own as the problem was progressing. No one takes the place of a child's mother in times of need. I know people, adults and children, whose parents have left them in need in the care of others and few feel it was the best decision. I have a right to my opinion. Christina put HER situation (which could have remained her own private issue, if she chose it to be so) on a PUBLIC discussion board. Those who are so thin skinned that they can't handle a little disagreement with others need not post on a public board. One doesn't post on a public board and expect nothing but accolades, those who do last a very short time on the internet. I sent my daughter to girl scout camp. She wanted to go very much. But, once there, she was miserably, horribly homesick. These was not a fleeting period of sadness. She cried the whole time. The counselors teased her and laughed with each other about it. They did not contact me to let me know how she was doing, and I think that was disgustingly negligent. They should have given me the choice of whether to leave her there or pick her up early. This was NOT a positive experience of learning to face anxieties. It was an extremely traumatizing experience that left her with years of abandonment fears. If you want to claim that I'm abusing you, or the author of the original post, go for it. In my opinion, I'm just sharing a different perspective. Why Do We Send Our Kids to Sleepaway Camp? Why Do We Send Photos of Our Kids as Holiday Cards?